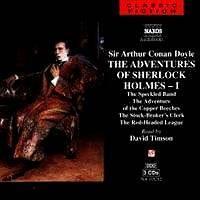 THE ADVENTURES OF SHERLOCK HOLMES Vol. 2. A Scandal in Bohemia, The Adventure of the Engineer's Thumb, The Five Orange Pips, Silver Blaze. Read by David Timson. Music: Moeran, Paganini, Suk, Smetana. Naxos Audiobooks NA317012 219m DDD. 'Holmes, you are too late'. This tragic and disquieting line depicting the end of Mr. John Openshaw at the hands of the Ku Klux Klan sums up most of this outstanding volume of stories read by that inimitable David Timson. It is indeed a pleasure for fans of the legendary sleuth to know that Naxos are slowly trailing through the Doyle canon with such a talented portrayal at the helm. David Timson's voice is sharp as Holmes, conservative as Watson, deep in ruffians, high pitched with women, a whole plethora of characters are heard with almost effortless mastery by this born actor! In fact, two of my favorite Holmes stories are included here and I can safely and happily state that both come up fully to my expectations, especially the sensationally sinister 'Five Orange Pips'. The famous and devastating importance of 'A Scandal in Bohemia' is beautifully read by Timson who imparts a delightfully American like accent to Ms Irene Adler. Her ingenuity and remarkable sense of anticipation leaves us all marveled, not the least Holmes and the dispirited Bohemian King. Another singular and capital case is the one devoted to that sinister episode of 'The Engineer's Thumb'. Timson makes a remarkable Mr Hatherly and the limpid Germanic tones of Colonel Lysander Stark reveal a dastardly and ultimate ruthless villain. We are transported to rural Bedfordshire and that bleak house where fuller's earth was supposed to be pressed with the chilling narrative revealing some singular escapades by the young engineer. As stated beforehand, my favorite is 'The Five Orange Pips' where a terrifying web of crime and retribution based in America comes to British shores and kills innocent victims, unaware of some terrible secret left by ancestors. Timson is obviously in his element narrating these events and Moeran's string music is delightful accompaniment. Finally we have 'Silver Blaze' where Holmes' uncanny cunning and super sleuth gifts are put to profound tests in solving a corpse and a vanished horse. There is much to enjoy here and now I wait for classics such as 'The Adventure of the dancing Men' and 'The Final Problem' before too long (one hopes). In the meantime I shall watch my mail and hope not to receive any orange pips in the post! I definitely won't put my papers on the sundial!